I have been wanting to try baked oatmeal. Do you think you could use regular oats instead of quick cooking? Sounds good. Thanks. Do you think this would freeze well? My kids are small so we don’t need this much at once. Actually, baked oatmeal freezes very well. Just put portion size into a rubbermade or like container and freeze it for easy serving. I had some in the freezer for several months and just thawed it in the microwave for a short time, then added some milk and heated them together. It was delecious! very interesting. i think i’m going to have to make this and try it out. i’m not a big fan of oatmeal in any form but since your son likes it, i’m going to try it! Amy, I think you could use regular oats but it will change the texture some. I would also add a little more milk into it when I cook it. Reid, I don’t think this will freeze well. I really think it would change it too much. However this recipe would be easy to 1/2 or 1/4. And if 1/2 would be too much, this is good leftover the next day or two. I’ve never made baked oatmeal, I have to try thisas I lover oatmeal! I’m printing this right now! I think my oatmeal lovers would adore this, as would my husband who is a sucker for anything peanut butter flavored! Thanks for posting your recipe! Mmmmm… sounds delicious. I make regular peanut butter oatmeal regularly, and I always put a banana in it (a banana for every 2 servings). I’ll bet a couple of mashed bananas in that recipe would be AWESOME, and you could use less sugar. I am not sure how I found your blog, but I am glad I did! This sounds delish. I think I will make it today for breakfast tomorrow! Thanks for sharing it. Now that’s my kind of breakfast – it looks and sounds delicious. gonna have to try this…….thanks! This looks fantastic! I can’t wait to try this. Thanks for sharing. Since you have trouble with breakfast ideas…I have an egg casserole recipe for the crockpot…it’s very yummy…if you’re interested let me know and I’ll send it over. These are the kinds of breakfast recipes I just LOVE. Quick – easy – healthy. And the variety you could make with this is probably endless. I need easy, yummy breakfast ideas for my young girls that will fill them without a lot of junk – this looks like a perfect addition to our morning menu ideas! This morning, when I read this, I think I actually “mmmm”-ed out loud, in an empty house! I love oatmeal, and have made baked oatmeal before, and put PB in my regular stove-top oatmeal, but never thought to combine the two! You are genius! Anyway, I made a quarter recipe for lunch today, and had the inspiration to substitute pure maple syrup for the brown sugar. I think it was a good touch! (Actually used 1T in baking, and drizzled most of another T over it when served.) Thank you for the recipe! This was a good recipe. I halved the recipe. I cooked it in an 9-in circle pan. The only thing I would do different next time is add a little more peanut butter and brown sugar. Thanks for the recipe. Man oh man. That sounds right up my alley– I’ve put chopped almonds in my oatmeal but almond butter sounds awesome. I’m wondering if you could mix this up the night before and then bake it in the morning. What do you think? Have you ever tried that variation? unfinishedmom, I have not tried it, but I think it will work fine. I have made other baked oatmeals the night before and they work so I don’t see why this one wouldn’t. If you try it, let me know how it turns out. I might try it next time I make it. @Lynn, I tried making this the night before and it works great. Thanks for the recipe! I’m so happy to hear that you can make it the night before. I was going to ask the same question. I know this is an old post, but your recipes for baked oatmeal look pretty popular. I’m posting in regards to mixing the night before. I make a very similar version of your baked oatmeal that requires a soak the night before due to the natural of phytates in the oats that inhibit digestion of whole grains. See http://nourishedkitchen.com/?s=soaking+grains for more information about why/how. That being said, I will be soaking all these recipes that you post and trying them that way. It’s a healthier and more digestible way to eat oats. Hope that helps! I love your blog BTW, thanks! we tried this last week and loved it! it was quite delicious, although at first i was a bit skeptical about the peanut butter in it (i love pb and i love baked oatmeal, but i wasn’t sure about the two of them together). definitely a repeat recipe in our house! These were WONDERFUL! My daughter doesn’t like oatmeal at all and liked this. Thanks for the great idea! Tried it, loved it, blogged about it! I’ve never even heard of baked oatmeal before but this sounds and looks delicious!!!! I’m not sure where I found your blog…through a click from another blog but I can’t remember where. Anyway, this was on her menu and we had it for breakfast this morning. Yummy! I’m a fan of baked oatmeal and peanut butter so I just had to try this. I only used half of the sugar and I think next time I’ll use honey instead as I do in my regular baked oatmeal recipe. Oh and I made it the night before and then popped it in the oven this morning. Perfect! Thank you! 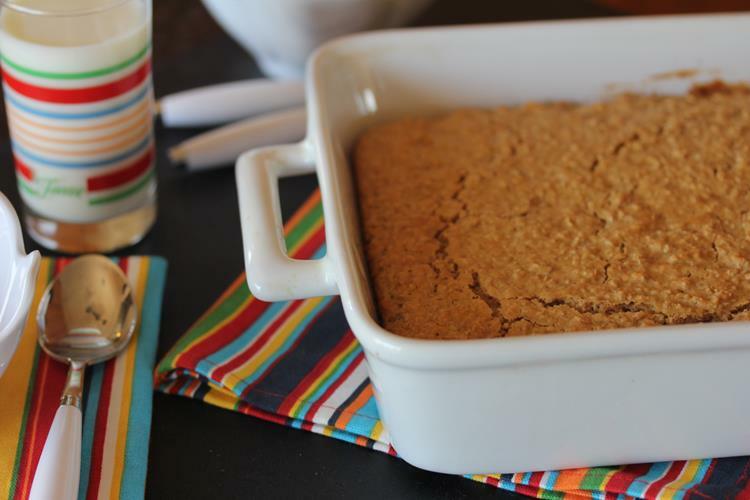 I have a recipe for baked oatmeal but I think we would like this peanutty one better. I’ll definitely be trying it. My daughter will love it! 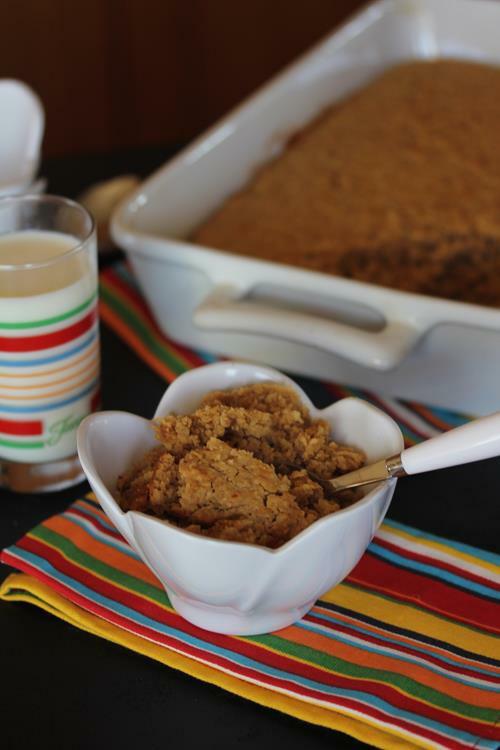 .-= DarcyLee´s last blog ..Whole Grain Cooking =-. I made this this morning and it was wonderful! My two year old had two bowls! Thanks for the recipe! I whipped this up last night to pop in the over in this morning. Very warm and comforting! Both kids enjoyed 2 helpings. I used coconut oil in place of butter and hazelnut milk in place of dairy, gf oats. This is a keeper, thank you. This sounds like something we would like for breakfast. I need something quick and easy, and a warm breakfast sounds really good! .-= Charla @ Healthy Home Blog´s last blog ..Homemade Cookies! =-. I just made this for my kids. They said it smelled like “No Bake Cookies”. This lead me to thinking it needed chocolate. I sprinkled mini chips over the top and it was great. I am like you though, and can’t leave a recipe alone. I replaced the brown sugar with sucanat and baked it in my Pampered Chef Bar Pan. Personally I think it could be a little sweeter but nobody is complaining so I will leave it alone. Thank you for this great breakfast recipe. @Relish_Desserts, I am not sure on the crockpot. I have never been a big fan of crockpot oatmeal. I think it changes the texture too much, but I know a lot of ppl cook oatmeal in the crockpot. If you try it and it works let me know. I am sure others would love to know if it works well. Very excited to try this out today! Made this last night for my hubby to warm up throughout the week for breakfast. It was definitely yummy right out of the oven, but next time I might make a few adjustments. I might add a bit more sugar or throw in some mashed up bananas/raisins to add a little sweetness. Also, we have both yet to try it with milk poured over it, but I bet that is awesome. Thanks for the recipe! YUUUUUMMMMMMM! I have never heard of baked oatmeal til recently and I found a connection to your recipe at another blog which suggested adding chocolate chips and a scoop of vanilla ice cream on top, so we tried it this morning – I got rave reviews from all! My kids totally thought they were eating dessert for breakfast – I’m sure they are telling everyone at school right now. I can’t wait to hear what their teachers have to say?!?!!? I will be trying the other suggestions from these comments too – it was so easy and filling – definitely better than the average oatmeal or bowl of cold cereal! Thanks for the inspiration! Just made this and it’s very tasty! It’ll be my breakfasts for this week. I’ll probably drizzle it with a liiiiitle buckwheat honey and pour a splash of milk over it. Thanks for a great recipe! Wow this was delicious! I had never made baked oatmeal before and I’m so glad I tried it. I followed the recipe and adding a bit of mini chocolate chips at the end and the kids went crazy for it. Even my super picky eater ate 2 bowls! I would love to see you post other versions of this. Thanks! @Jeannie, I am so glad that you enjoyed it! It is a great breakfast and adding a little chocolate to it makes it a kids pleaser for sure. @Jeannie, Oh and I have other versions coming up. I have been altering this basic recipe and have come up with some great new versions that my kids love. Just made this over the weekend and loved it! Perfect for a cold wintery morning! I make a soaked peanut butter baked oatmeal, but also put in chocolate chips. Yummm! Kids thought this smelled like peanut butter cookies while it was baking. It was very yummy! @Katie, I am so glad you liked it. This is such a kid friendly breakfast! It does smell a lot like pb cookies. I have made this several times now and my family and I love it! I bake it at night and then reheat it the next morning. I crave it all the time and make it at least once a week! Thanks for such a great recipe! @Morgan, I am so glad that your family enjoys it! I agree it reheats really well and kids love it. This was amazing!! I made it in a little mini bundt muffin pan thing so that I could pop the “muffins” in the freezer and use as needed! Personally, I’m not a fan of oatmeal and I haven’t liked baked oatmeal in the past b/c it’s still too mushy for me (which is why I baked it the way I did). The kids can pour milk over it or eat it like a muffin like I do! @Jen, I love that idea!!! I am going to have to try that with my baked oatmeals. I never thought to freeze it, and making it in a muffin or bundt type pan would be perfect! Thank you for sharing that. I was just wondering whether I could make this without the peanut butter? If I did would I need to substitute something else in, like applesauce maybe? Thanks! @Taylor, I have a banana version https://www.lynnskitchenadventures.com/2010/12/baked-banana-oatmeal.html and a pumpkin version also posted on my site. 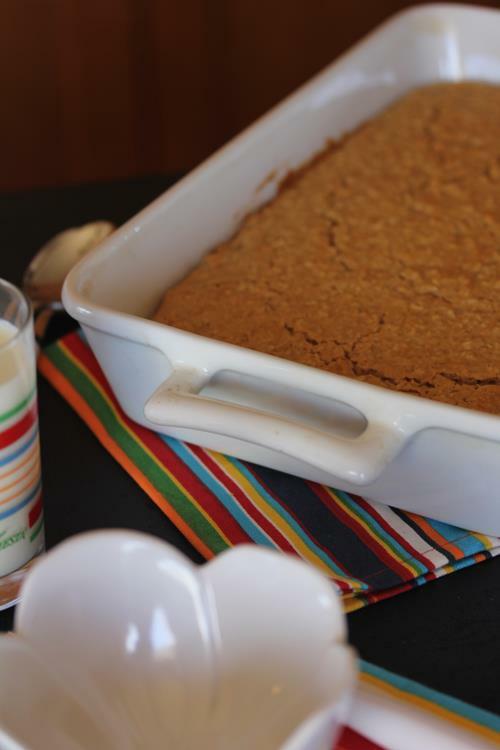 https://www.lynnskitchenadventures.com/2010/11/baked-pumpkin-oatmeal.html I have not posted the apple version yet, but they are all the same basic idea, so yes you can tweak the recipe and it will work without peanut butter. I had a hankering for this for breakfast so we deviated from menu plan and made it! SO easy to whip up and bake, pantry ingredients … you’re the best, Lynn! Plus my daughter gobbled it up and she eats practically nothing. @Vanderbilt Wife, I am so glad that you like it! It is so kid friendly. I love to make a big batch and use it for several days. It reheats really well. And if she liked this version you should try my banana or pumpkin version. 🙂 My kids love them all. Used this recipe many, many times. Both for breakfast, a dessert and a brunch item. Never added peanut butter…till now. Have used every kind of fruit you can think of…anything that is about to spoil gets thrown in. New subscriber. Love new recipes and your site is just beautiful and clean and easy to navigate. I have been waiting to try your peanut butter oatmeal til my daughter was old enough to eat peanut butter….I haven’t made it yet, but I did reference your recipe in my blog post today on baked oatmeal. I make this today and topped it with your Peanut Butter Syrup! My small family of 4 ate all but 3 pieces for Breakfast and snack today. I put in 2 cups of milk instead of 1 realizing it was too late just added another cup of oats and it worked perfect! Great Recipe for both the oatmeal and syrup. @Kristin, I am do happy that your family enjoyed both recipes! This looks great. i have two questions after reading through the comments. 1) i would be using rolled oats instead of quick oats, can you tell me how much extra milk i should add? I would use a couple of tablespoons extra. I have never used all reg. rolled oats but I think that would be enough. Here is my banana version. It does not have Peanut Butter in it, but it will give you an idea of what I do. I hope that helps. Sooooo yummy! Tonight I made a slightly different version, and added some cocoa powder and a mashed banana. So. Very. Tasty! Do you think you could use honey instead of brown sugar? I use honey instead of brown sugar and its great. A little different flavor but its still delicious! I also use unsweetened applesause instead of butter. Also on a side note: These are really good cold as well. I just cut them into bars and eat over plate because it will be crumbly. Love the idea about the muffin tins. Does anybody know how long these will stay good in the freezer? I just got a big freezer and I’m super excited to make a bunch of stuff all in one day to have food I can eat over the month. I want to make a batch of all the different flavors so I can have variety. I have kept them in the freezer for a month or so. They might last longer than that, but we always seem to eat it all first. 🙂 I am glad that you enjoyed it! I haven’t tried your recipe for baked oatmeal yet but have made a few different baked oatmeal recipes every Sunday for at least the last year. It is a very filling breakfast that holds us off for our late lunch. ALL of my 5 children love it! I don’t use any sweetener in mine but serve it over fresh applesauce (made in my Vitamix). We don’t even miss the sugar! Just last night I was asking my husband how I could alter the recipe to give us a bit of variety. Peanut butter never occurred to me! I will have to try that next Sunday. Thanks!! I have tried baked oatmeal in a local restaurant. It is delicious, has a cake like texture rather than the usual dense texture and is 3 inches high. Do you have a recipe that meets this description? I made this today and we all loved it! So easy to whip together and full of peanut butter goodness. My daughter and I liked it plain but my son poured warm milk on it and thought it was delicious. I blogged it as well. Will make this again & again and try different things, like chocolate or peanut butter chips for a treat, although I love that it’s reasonably healthy just as is. I actually had it for lunch today! I have been reviewing recipes on my blog and I reviewed yours today as my first one! Don’t worry – I only shared my own pictures and linked back here for the full recipe so that you could protect your content. I just told my thoughts on it (that it’s yummy!). Thanks. I am glad that you enjoyed it. And thanks for just sharing the pictures and linking back to the recipe. Try adding chocolate to it next time. It is really good! My Mom makes this now too since she read my blog about it. Great recipe. I am glad you liked it. Thanks for letting me know. 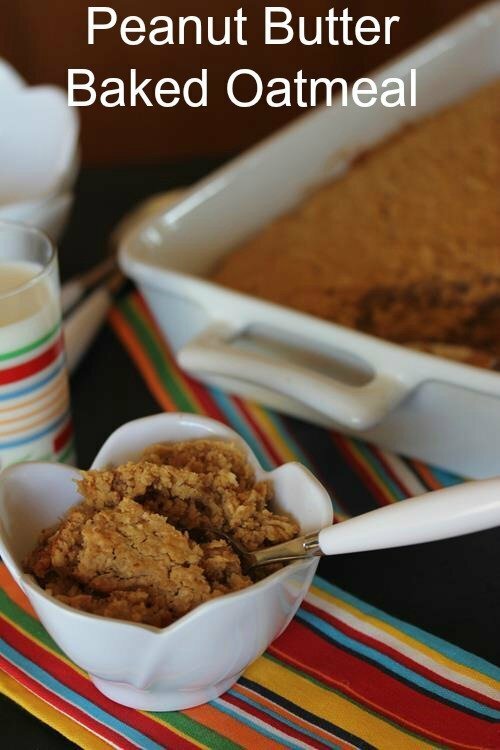 I saved this recipe for a little bit and I finally decided to make oatmeal cookies and this peanut butter baked oatmeal. I tried a baked oatmeal before but it had flour in it so I am interested to find out how this one is different!!! Well, I was quite a sleepy head this morning while baking, but despite my mistakes the oatmeal bake still turned out great. (By mistakes I mean that I forgot to add the melted butter and had to just drizzle it on top at the end, only to realize while commenting here that I had completely forgotten the eggs, too! LOL) Some changes were due to what I had on hand (subbed regular yogurt for vanilla, old fashioned oats for quick cooking), others intentional for calorie count (halved the sugar, no extra toppings). This dieter is happy with something different to do with her oatmeal! Thanks, Lynn! Thanks, too, to jennaathome.wordpress.com for getting me to this recipe. Here I am two years later still making this recipe and still loving it! No adjustments, omissions, or substitutions when I made it this morning–just exactly as written. Wonderful recipe! Thanks again, Lynn! I am so glad that you still enjoy it! My family still loves it as well. Thanks, I am glad you all enjoyed it. Baked this up today using almond butter (we ran out of pb) took out all the eggs and used Maple Caramel tofu, used coconut milk, and added a tbsp of cinnamon. Delicious! Served it up with a banana coconut milk puree. Perfect for a cold morning. Thanks for sharing! It is amazing how changing the name of something makes them like it better isn’t it?! I have had similar things happen in my family. 🙂 You could easily try that with my other baked oatmeals and all them oatmeal muffins, they might just start liking oatmeal. 🙂 And thanks for your kind words. I am glad you like my site and recipes. Thank you for reading. I just made a healthy peanut butter and jelly bar using this recipe. Omit the brown sugar and add 1 mashed banana to the batter. Pour half the batter in your pan then spread a thin layer of melted jam/jelly. Carefully spread the remaining batter on top and bake. YUM!! I know this is an older post, but I wanted to chime in that I make all of your baked oatmeal recipes in an 8×8 dish. I use the same amounts of everything but use the smaller size dish. It bakes for about the same amount of time, believe it or not. It makes for a thicker piece, which my gang likes! Love your recipes! Thanks! I have used an 11×7 pan, but not an 8×8 one. I am going to have to try that sometime and see how my family likes it. Thanks for sharing that it works. And I am glad you enjoy the baked oatmeal recipes. I love sharing them. made this for my 11year old and she loves it. She likes it in a bowl with a little syrup on top and a milk moat! Thanks so much for sharing! Your recipes are great. I need advice though. 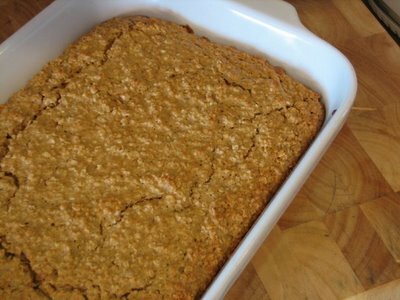 Unlike the other baked oatmeal recipes of yours that I’ve made, this peanut butter one wants to fall apart when I cut and serve it instead of coming out in squares. It is not dry, just crumbly ( which = big mess in the world of kids). Thank you! This one is a little drier than some of the others. I would just add a little more liquid/milk to the recipe when you make it. You could also cook it for a little bit less and see if that gives it a texture you like better. I hope that helps. Added the yogurt component from the blueberry baked oatmeal recipe into this one the next time—- worked like a charm!!! My husband loved this oatmeal and the rest of us did not like it at all. I really wanted us all to like it since we like oatmeal and peanut butter. It just didn’t go over well. I wish it had. Thanks for sharing the recipe. You never know unless you try. My family has always used the Mennonite Cookbook recipe, but one day we could not find it. So we looked up ‘baked oatmeal’, and found this. We did not have enough eggs to make enough for everyone, so we used mashed banananas. It is amazing! Thank you for the wonderful recipe. I am glad you enjoyed it. Bananas and peanut butter go together great so I love that combination for this. I love all your baked oatmeal recipes! I haven’t tried them all yet. We’ve had the Strawberries and Cream, Peaches and Cream, Apples and Cinnamon and this Peanut Butter Oatmeal. Each one has been delicious! I can’t wait to try more. They are healthy, nutritious and filling. What a great start to our mornings. One thing that I have done that has saved some time is I put the 2 tablespoons of butter in the bottom of the dish and place in the oven as it is warming up. I mix everything up and then pull the pan with the melted butter out of the oven and place the oatmeal mix in. The butter keeps everything from sticking to the pan and it crisps up the edges a bit too. Saves me time because I don’t have to melt the butter or spray the pan. Also saves time with the dishes! That is a great tip! Thanks for sharing it. I am going to have to give it a try. it had great flavor, but it was very crumbly compared to your pic. it woudn’t never stayed in squares. What did I do wrong? Mine does not always cut into perfect squares either, especially when it is hot from the oven. If it was really crumbly, it might have overcooked some, so you might try reducing the time a little. I hope that helps.